An excellent desert noir with the added allure of 3-D, Roy Ward Baker's Inferno (1953) is so good that even those who generally steer clear of older movies almost certainly will find this immensely engrossing. Though the stereophonic soundtrack is presumed lost, the dual-rig 3-D cinematography, in Technicolor, is superb. The movie generally avoids gimmicky uses of the process, letting the striking desert scenery speak for itself. It's one of the best looking 3-D movies of the 1950s boom, and the screenplay and direction are as good as the images. 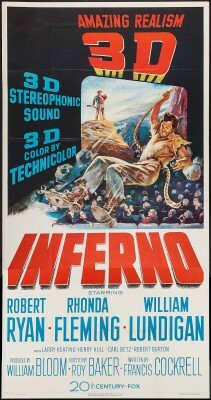 Sought after by enthusiasts, Inferno has an unusual history on Blu-ray 3-D. A small independent label in the U.K., Panamint Cinema, first released Inferno several years ago, initially as a Region B-locked release, then sometime later they quietly reissued it a region-free disc. Twilight Time's new release appears to utilize the same superb transfer, but with different extra features. The taut script involves a murder plot already well underway as the film begins. In the vast Mojave Desert, mining engineer Joe Duncan (William Lundigan) and his lover, Geraldine (Rhonda Fleming) have abandoned her husband, Donald Carson III (Robert Ryan), he having fallen from a horse and broken his leg. They've already told him they would ride back for help, but in fact have been busy planting false clues suggesting Carson is 60 miles in a different direction, all to ensure that, once missed, he can't be found. Carson's lawyer and business manager, Dave Emory (Larry Keating), isn't initially concerned as Carson, a bitter, impulsive millionaire, has a reputation for disappearing for days on end. As Carson was born into wealth and has no practical experience in the desert, Joe and Geraldine are reasonably certain he can't last more than a few days in the desert, and they half-nervously, half-confidently observe the growing concern and eventual search. Carson, meanwhile, eventually realizes what has happened to him, and that his only hope for survival is to set his broken leg, climb out of the mountains into an open area where rescue planes might see a nighttime signal fire. What makes Inferno so outstanding is how the movie audience vicariously experiences Carson's struggle to get out of the desert alive. He, like most of us, hasn't a clue how to set his leg or make a splint, how find drinking water, or how even to secure a rope to climb down the steep, jagged canyon. He makes the sorts of mistakes we might make ourselves, sometimes injuring himself in the process. He manages to shoot a rabbit to eat, but before he can retrieve it a coyote has already made off with it, and he's as frustrated as we would be. Carson's broken leg and his past reputation as an overindulged, difficult man who's always spent his way out of even minor inconveniences make his task even more difficult, but he's realistic enough to understand that he has little choice but endure if he's to stay alive. Initially a thirst for revenge drives him, but without Carson ever saying so he gradually comes to realize that his horrible experiences are making him a better man in the process. Robert Ryan was one of the five or six greatest character actors in American film, though from roughly 1947-1962 he generally played psychologically scarred leads or a heavy of equal intelligence and imposing physicality opposite the main lead. Though not one of his signature roles, Ryan-as-Carson is nonetheless excellent, while Fleming, Lundigan, and Keating are all well above average. The only other part of any consequence is that of an old prospector, played by character veteran Henry Hull. He was often hammy, but delivers wonderfully subtle work here, in beautifully understated scenes near the end. Cinematographer Lucien Ballard, at his best outdoors in films like The Desert Rats (1953), Ride the High Country (1962), and The Wild Bunch (1969), brings out the lonely, harsh qualities of the desert, which are greatly enhanced by the 3-D. Carson's peril is underscored in shots plainly showing how high up Carson is, and how treacherous the rocks are below. Twilight Time's release of Inferno seems to utilize the same transfer as Panamint Cinema's. The image has startlingly rich color: in one scene Lundigan wears a suit so cobalt blue it's almost otherworldly. There's nary any sign of damage or age-related wear and the 3-D is near-perfect, with only the opening titles blending curiously into the desert fauna, presumably a flaw built in with the original release. Again, the use of 3-D is so understated that it's effectiveness often takes the viewer by surprise and overall this is one of the very best 3-D releases to date. Those without 3-D equipment can watch the film in regular ol' 2-D. The absence of the original stereophonic tracks is mildly disappointing, but the DTS-HD Master Audio mono is excellent as well, and supported with optional English subtitles. Limited to 3,000 units and region-free. Supplements include an isolated music track and audio commentary by Alan K. Rode and Robert Ryan's daughter, Lisa. "A New Dimension of Noir" seems to be a repurposed featurette from an older, 2-D DVD release. A trailer is also included. An excellent, original noir with outstanding 3-D via its superb transfer, Inferno is a must-see and a DVD Talk Collector Series Title.